I was in fifth grade when I first learned that books had power. Mrs. Jarrett read aloud to us every day after last recess. It was near the beginning of the year as she was reading A Wrinkle In Timeopens a new window when a girl I didn't know very well raised her hand. Mrs. Jarrett stopped reading and asked the girl if she had a question. The young woman stood up and said that she didn't think we should keep listening to the book because the author was lying to us. Mrs. Jarrett answered that since the book was a work of fiction the author was allowed to play a little loose with the truth but went on to ask the student specifically what lies she felt the author was telling. The girl replied that everyone knew that humans were the only people in the universe and that Earth was the only planet in the universe and we knew this to be true because God had told us so. To Mrs. Jarrett's credit she was able to make the student feel heard while also getting the girl to agree that even though she felt the author was lying, there might be other people in the classroom that believed differently, and we were able to continue reading the book without interruption. At the time though I couldn't appreciate my teacher's deft handling of this tricky situation because my mind had just been utterly blow open. There were people that didn't know about the other planets in the solar system?!? Or maybe they had heard about them and didn't believe they were there? And why wouldn't they believe it?!? And how could they know without a doubt that no one else existed in the entire vastness of space?!? Since 5th grade I have re-read A Wrinkle In Time and now that I'm older I'm more struck by the book's central theme of the power of love over evil and oppression than the fact that the characters bend space and time while visiting planets unknown. Meg saves her brother Charles Wallace simply by loving him, and the power of her love allows Charles Wallace to escape from the evil of IT. 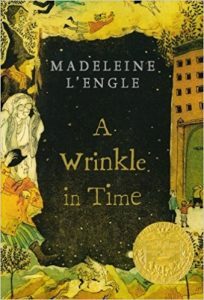 That theme is undoubtedly one of the reasons why A Wrinkle In Time has remained continuously in print ever since it was published in 1962, even while it is also one of the most challenged books in children's literature. New generations of fans are soon to discover Madeleine L'Engle'sopens a new window most famous novel when the movie, directed by the incomparable Ava DuVernayopens a new window and starring Storm Reidopens a new window as Meg, Mindy Kalingopens a new window as Mrs. Who, Reese Witherspoonopens a new window as Mrs. Whatsit, Chris Pineopens a new window as Meg's father, and Oprah Winfreyopens a new window as Mrs. Which, is released in March 2018. Read it again, or for the first time, before the movie debuts in March 2018. Download the audiobook version from the Cloud Library! eBook copy from the Cloud Library. A great gateway graphic novel if you normally don't read the format.